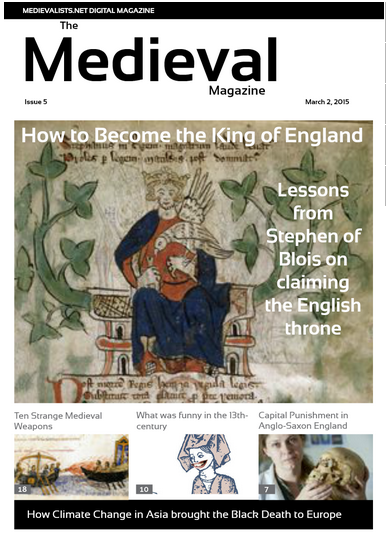 In this issue of The Medieval Magazine we take a look at surprising rise of Stephen of Blois to become the King of England, just three weeks after the death of Henry I; ten unusual weapons from the Middle Ages, and what was funny in 13th century Iceland. Unless you were the son of a king, the most difficult job to obtain in the Middle Ages was to become a king. Even if you were shrewd and had the support of strong armies, the chances of successfully seizing the throne were often very low. Yet, in 1135 a count named Stephen of Blois was able to become the King of England. Here is his story of success. ￼What were some of the more unusual weapons used by medieval armies? We put together a list of the strangest weapons that were ever used (or even designed) in the Middle Ages. A group of Norwegian and Swiss researchers have uncovered links between climatic changes in central Asia and repeated outbreaks of the Bubonic plague in Europe, starting with the Black Death in the 14th century.